It was four o’clock and people were lined up outside the door. Soundcheck danced through the sanctuary doors and whirled around the lobby as our merch team set out Cultivate books and arranged bags of Maker Coffee. It would be two more hours before Lamb’s Chapel opened her doors to welcome the 2,200 guests who came to worship, and already the anticipation was building. March 16th was an incredibly special evening for our community. We gathered in Burlington, North Carolina at a local church that graciously offered to host a benefit worship night in our honor. Our dear friend, Steffany Gretzinger made the trip to come support our vision for the evening—to raise funds for the third goal of our 18 Inch Journey Campus Campaign. The event sold out weeks before, and on that evening people came from all over the country to pour their worship out on the feet of Jesus. This is what our community burns for. It never gets old, seeing people encounter the lover of their souls. This evening was one for the books. The Cageless Birds opened the night with songs from our upcoming album: Glorious, Generous Portion, Rainbow in the Sky and Ain’t No Grave, just to name a few. 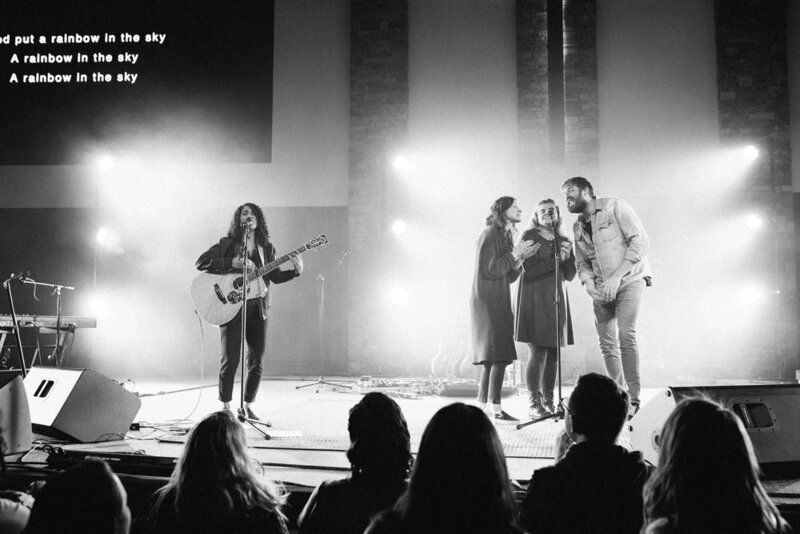 Then Jonathan, Melissa and Steffany led a set that led us deep into the beauty of His heart. It was a night of truth, of higher perspective and a return to joy. In one very specific moment, the Father came with an invitation to heal minds, depression and anxiety. As people were emptying out their thoughts before the Lord, Steffany led us saying, “After we’ve emptied everything out, we have to let Him fill us back up with His light.” Together, 2,200 people sang Open Up Let the Light In over our hearts and minds as we let Him flood us with His goodness. Heaviness lifted. He came. Joy filled the room and we were changed. We love these evenings, and we are so excited to invite you to join us for our 2019 Carolina Worship Nights! Tickets are now available at www.carolinatheatre.com for our June 29th and December 6th events. We hope you’re able to join us! We’re also excited to announce that during our March 16th benefit night, we raised over $68,000 toward Goal 3 of our Campus Campaign! All of these funds will go toward building a new cabin for staff and student housing for the 18 Inch Journey. Our heart is to continue to expand our campus so we can keep growing our discipleship schools. To learn more about what we’re dreaming into or to donate to the 18 Inch Journey Campus Campaign, visit www.18inchjourney.com/campus-campaign. Finally, we want to say thank you to everyone who attended the worship night on March 16th and gave so generously to our mission! A special thanks also to everyone at Lamb’s Chapel who hosted the event and made it possible! We can’t wait to share more of the journey with you!